The Megafon SP-A20i Mint is an ‘Intel inside’ smartphone with NFC that is only available in Russia on the Megafon network. The handset features a 4.03-inch, 600 by 1024 capacitive touchscreen and is driven by a 1.6GHz Intel Atom Z2460 processor. Out of the box the Mint runs Android 2.3.7, with an upgrade to Android 4 available. 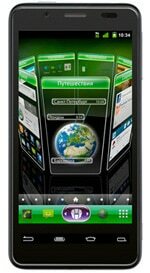 Learn more at Megafon’s SP-A20i Mint page.